EnchanteurⓇ Paris has been in the industry for 23 years and currently standing as No. 1 brand in the mass market category of fragrances. The brand is inspired by the inherent beauty of the first burst of spring in the Parisian gardens, from the formal gardens of the Tuileries to the sprawling greens of the Champ de Mars, the atmosphere encapsulate vivacious romance. EnchanteurⓇ owns a wide range of quality and timeless French inspired fine fragrances and fragrance infused body care products to spark moments of romance at every stage in woman's wondrous journey of love. 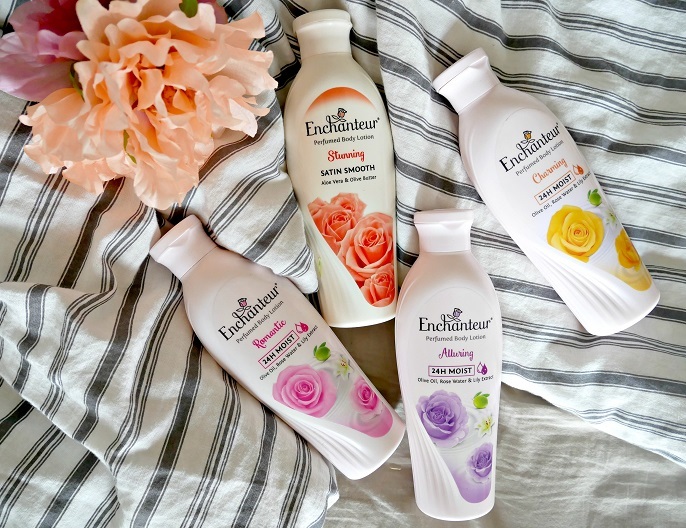 The EnchanteurⓇ Perfumed Body Lotion range offers 4 types of scents to complement all the different occasions and moods, includes #1 Stunning, #2 Charming, #3 Romantic, and #4 Alluring. And, all these 4 scents are performing distinctly which include satin smooth, 24h moist and radiant white. 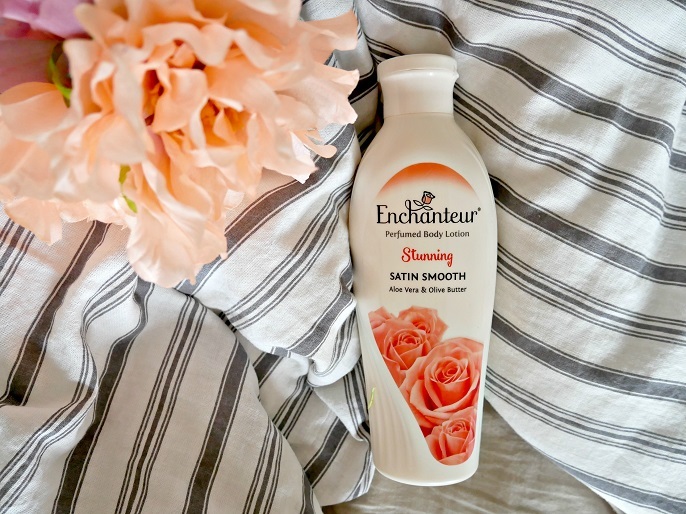 EnchanteurⓇ Stunning (Satin Smooth) is formulated with non-greasy and specially enriched with Aloe Vera and Olive Butter to give your skin optimum moisturization and nourishment. It has an elegant fragrance of Turkish Roses, Gardenias and Blackcurrant Buds to make you has an distinctive smell from the others. All these three EnchanteurⓇ Charming, Romantic and Alluring Perfumed Body Lotion (24h Moist) contains Rose Water, White Lily Extract, and Pure Olive Oil for nourished and healthy skin. It is clinically proven to give your skin an immediate moisturizing up to 24 hours, keeps your skin silky smooth, and leaves you creating a scentful impression. The texture is aqua base formulation so it's not oily when you apply it on skin. The design of each bottles are same, except the colouurs of each performances, for instance satin smooth is in creamy bottle, 24th moist is in pink, and radiant white is in white bottle. The 24h Moist has 220ml in each of the bottles, and Satin Smooth accomodates 250ml products. The bottle is designed in an open and squeeze type which is convenient to use and bring it to everywhere with you. I love the texture and the smell! The absorption is great because it absorbs really well and keeps my skin so soft and smooth. The smell is so beautiful too to be perfume, or even better! Personally, I love the Stunning Body Lotion because the scent is very warm which smells like sweet soft baby powder mix. I'm absolutely satisfied with this product! Smelling good makes you feel good, and I can't agree no more! A good smell can boost your mood, and make people around you feel good as well. 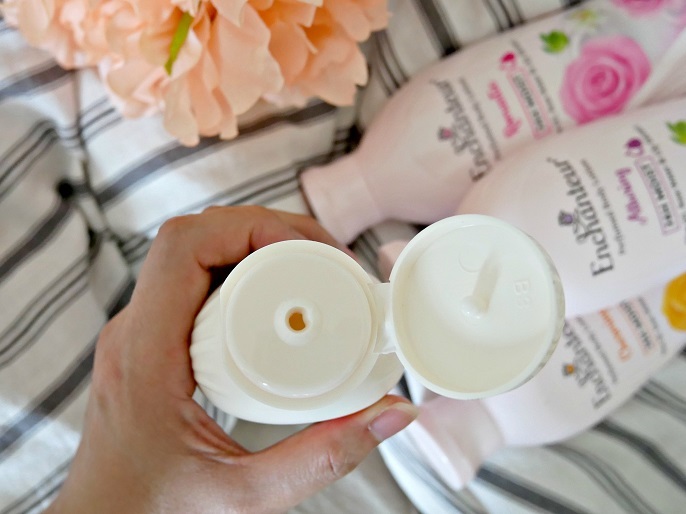 The first time I put on the EnchanteurⓇ Perfumed Body Lotion after I showered, Lik immediately said "Wow! What's that lovely smell?" 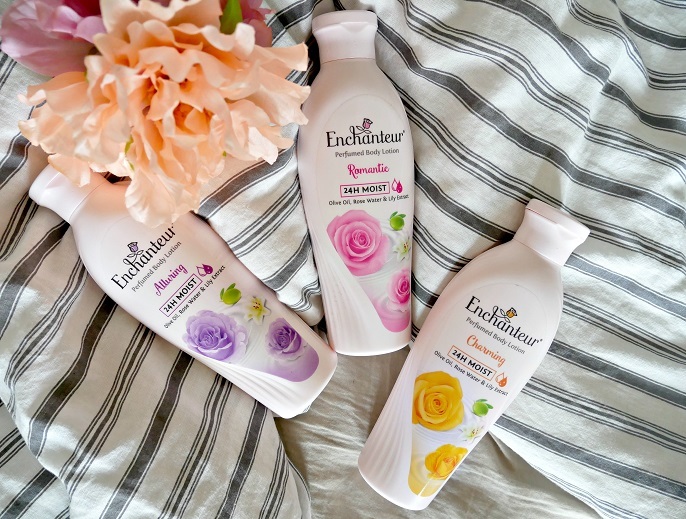 If you are interested in EnchanteurⓇ Perfumed Body Lotion, you can get them from Watsons, Guardian, Lazada or Shopee. For more information, feel free to look up at their official website at http://enchanteur.com.my/.